Paul had never been to Rome when he wrote the letter to the Romans, though he had clearly expressed his desire to travel there in the near future (Acts 19:21; Romans 1:10-12). The apostle greeted 26 different people by name, personalizing a letter from a man who would have been a personal stranger to most of the recipients. No doubt they had heard of Paul and would have been honoured by the letter, but Paul always took opportunities to personally connect with his audience so that the message of the gospel might be better received. Paul showed how human beings lack God's righteousness because of our sin (1-3), receive God's righteousness when God justifies us by faith (4-5), demonstrate God's righteousness by being transformed from rebels to followers (6-8), confirm His righteousness when God saves the Jews (9-11), and apply His righteousness in practical ways throughout our lives (12-16). The structure of Romans provides a hint into the importance of the book in our everyday lives. Beginning with 11 chapters of doctrine, the book then transitions into five chapters of practical instruction. This union between doctrine and life illustrates for Christians the absolute importance of both what we believe and how we live out those beliefs. Does your day-to-day life mirror the beliefs you hold, or do you find yourself in a constant battle with hypocrisy? Take heed of the doctrine you find within the pages of Romans, but don't forget to put it into practice as well. 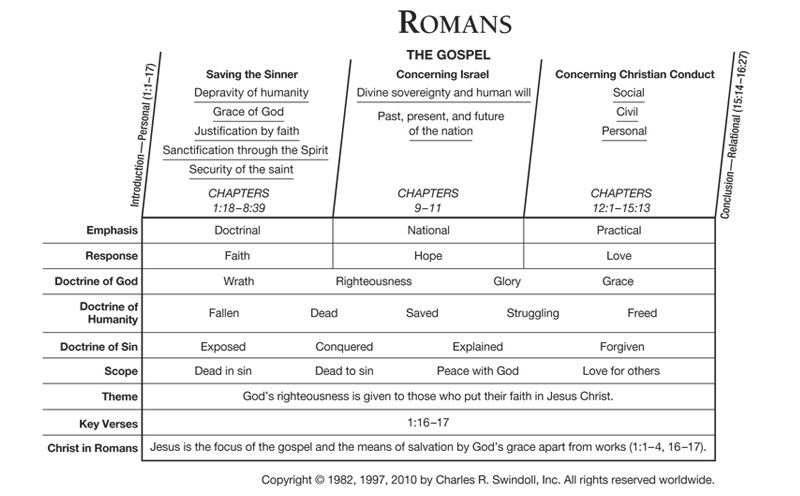 Find resources in the book of Romans in our resource library.